If you want to feel the spirit of the ancient Split, you are welcome to TIRAMOLA . Parts of the old stone walls, centuries old beams in the attic on the second floor of a traditional Dalmatian house, original wooden floors of teak, dozens of antique objects and details will turn you back to a bygone era. History can be smelled in the apartment and the immediate surroundings. In the same time you will enjoy full comfort and amenities provided by modern times, all in the heart of the ancient city full of life. 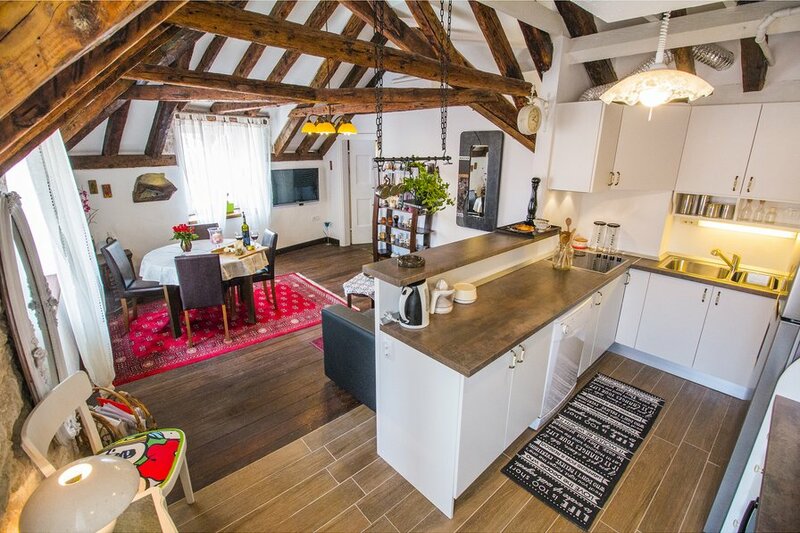 The apartment has just been completely renovated and equipped. The apartment is an ideal choice for family or two couples. In 78 m2 it features two climate-controlled bedrooms with private functional baths, separated by a living area perfectly suited for a pleasant break between daily activities. The apartment is filled with a sense of calm. It is spacious, bright and comfortable, ideal for a night's rest after a night life with "blinds" on the windows that provide absolute darkness. One bedroom features a double bed and the other has two single beds that can be joined as needed if announced. One of the bedrooms features hanging hammock to relax and enjoy picturesque view of the old stone houses in the area. Each bedroom has a TV and climate-control unit. One of the bedrooms features built-in safe with personal security code of your choice. The sofa in the living room can easily be transformed into a comfortable bed for one or two people. Each bedroom has a nice, large and fully-equipped private bathroom with heated floors, ample hot water, one standing shower and other spacious spa shower. Each bath has natural day light and a window overlooking the back yard. In addition to the standard bath items, a hairdryer and a washing machine with a handy amount of detergent are provided for your convenience. . The apartment features a brand-new, fully-functional and well-equipped kitchen with refrigerator with icemaker and cold water, stove and oven, dishwasher, espresso maker, microwave, toaster, electric kettle, mixer, and wide variety of dishes and cookware for your use. You can count on finding an initial supply of coffee, tea, sugar, salt and dishwasher detergent. Look for a half liter bottle of homemade brandy “rakija” with frosted glasses in the freezer. Seasonal fruit or candy will welcome you into the living room that features sofas, coffee table, dining table with four chairs, additional chairs, big-screen satellite TV, and air conditioning unit. The best restaurants, bars, shops, nightlife and places for major outdoor events – Riva, Pjaca, Marmontova, the Palace – are all nearby. Split’s rich history and fun places are all within 2-8 minute walking distance. Marjan Hill Park, also known as “city lungs” is nearby – this wooded peninsula is a serene place for a jogging, biking, hiking, swimming on various types of beaches while enjoying clean air and clear sea. Marjan Hill Park features restaurants and sport facilities, bicycle lanes, along with hiking paths to ancient churches, and even rock climbing promising the great views. City beaches are along the entire coastline of Split, excluding the port area. The most popular city beaches are the sandy beach Bačvice, and modern pebble beach Žnjan. Both feature cafés, restaurants and recreational activities. A minute away from the apartment is Rent-a-bike. For guests with personal vehicles, the 24-hour monitored public parking lot is 250 m from the apartment.